While working for a University, one gets to hear a lot of stories of the obstacles students have to go through to be accepted by a regionally-accredited University in order to reach their educational dreams. Some of these stories are funny, and some of them are sad; however, most of them are typical. Every now and then one gets to hear a story that defines what “true grit and determination” really means. Ms. Leidy Mary Darias was born and raised in Cuba. Shortly after graduation from the 12th grade, she immigrated to the United States. For her and her family, their biggest concern was to allow Ms. Darias to pursue her post-secondary education. A friend told her about Florida National University (FNU), its programs, and how FNU helps students pursue their educational dreams. Leidy expressed her interest in radiology and ultrasound to her friend. Without hesitancy, he put her in contact with FNU. Mr. Carlos Sanchez, an FNU Admissions Advisor, was assigned to guide her through the enrollment process. However, as part of the enrollment process she had to present her high school diploma which was in Cuba. Fortunately, she had a relative who was making a trip to the island nation. She contacted him and he agreed to bring the diploma with him on his return trip. On the day the relative was to return, Darias went to pick him up at the airport. Afterwards, she was going to stop by FNU to present the diploma and complete the admissions process. 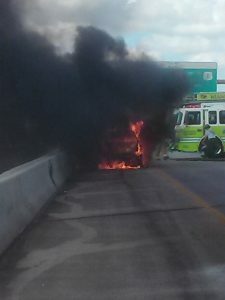 On the way to the airport, someone pulled up alongside of her and told her that her car was on fire. Immediately, she pulled the car over. The gentleman who warned her about the fire used his vehicle to prevent other vehicles from passing. This heroic action allowed Leidy and her fellow passengers to escape the burning vehicle without injury. 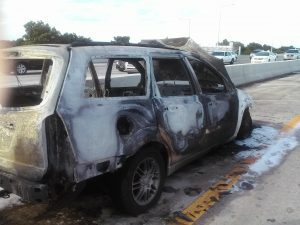 Unfortunately, the vehicle was completely engulfed in flames and burned beyond repair. After the first responders arrived and extinguished the fire, Ms. Leidy called a relative to explain the situation and asked him to pick up the relative who was at the airport. She called Mr. Sanchez and told him about her near-death experience and asked if she could reschedule the appointment. He obliged. This story is amazing because it clearly demonstrates that when someone has a strong desire to achieve a goal, he/she will not let anything get in his/her way.